I wish all collectors, all friends and visitors of my homepage and their families a MERRY X-MAS and a HAPPY NEW YEAR!! O'Nyle is out with another beautiful special Christmas Edition - those 5 packs are available in Red 100 and Gold 100. Last year, Marlboro released a Christmas pack as Marlboro Gold - this year they have a Christmas-Edition as Marlboro Red. West Blue is out now with new design. Chesterfield Red ohne Zusätze and Chesterfield Blue ohne Zusätze (without additives) are out now in brandnew design in woodfree paper. Because of new law in Austria in 2016 which allows just 20's or 25's Marlboro changed the XL packs to packs with 25's. The production of Casablanca White will be stopped soon and therefor there is a special foile on it for a short time to ask people to smoke Camel Silver instead in the future. 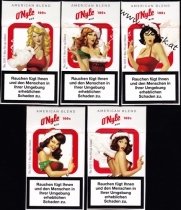 Another Austrian brand, Johnny Filter, will not produced anymore so therefor there is a special foile on it for a short time to ask people to smoke Smart instead in the future. Winston Red and Winston White is out with a new special edition to win a trip to the Tyrolean Alpes. Parisienne Jaune is out as a limited edition - similar looking like the Special Edition Austrienne which was out in Spring for European Song Contest in Vienna. Camel Filter and Camel Blue are out now as 25's pack. Marlboro Gold is out in new international design - Marlboro Silver changed design AND name to Marlboro Silver Blue. Pall Mall S-Line Blue is out now as 25's pack. West Silver is out in new design. Smart has released another competition - there are 4 packs to win to London. Batton Red and Batton Silver are out as a Value 25's pack. Black Devil American Blend is out in Yellow and Pink Edition with yellow and pink cigarettes. Pall Mall is out in a brandnew design now. Company DanCzek AT is selling German brand Mark 1 New Red with 10 mg tar and 0,8 mg nicotine (bar-code 4260367 984375) and Mark 1 New Gold with 6 mg tar and 0,5 mg nicotine (bar-code 4260367 983491). The brand L & M is changing to Philip Morris. Because in 2016 there is only allowed to sell packs with 20's and 25's in Austria, Winston and Lucky Strike are changing their XL-packs to 25's. But Benson & Hedges is selling for three months (until the end of 2015) their packs as special 20+1 for the same price like the 20's.